WASHINGTON (CNN) -- The United States wants Iran to provide international inspectors with full access to a newly disclosed underground uranium enrichment plant that Obama administration officials say is both illegal and probably intended for developing weapons. "Don't assert it. 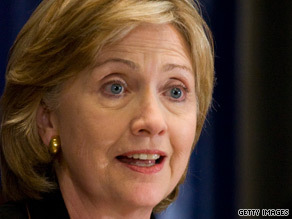 Prove it," Secretary of State Hillary Clinton said of Iran's insistence its nuclear ambitions are peaceful. However, an Iranian official called U.S. accusations about the planned facility -- which Iran disclosed to the International Atomic Energy Agency last week -- a propaganda effort to discredit his country before crucial talks with the international community on its nuclear energy program. Ali Akbar Salehi, director of the Iranian Atomic Energy Agency, called the new facility at the Qom site "very small" and "a back-up installation," the official Iranian news agency IRNA reported Sunday. Salehi repeated earlier assertions that Iran complied with all international regulations in reporting the existence of the planned site, according to the IRNA report. Two U.S. administration officials told CNN on Sunday that the United States plans to tell Iran this week it must provide "unfettered access" to the Qom site, the people involved in its construction and the timeline of its construction "within weeks." The latest dispute comes ahead of planned talks Thursday involving Iran and the United States, Britain, Germany, France, Russia, and China about international concern over Iran's nuclear ambitions. In interviews broadcast Sunday, top U.S. officials said Iran's newly revealed underground nuclear facility violates international requirements for reporting such operations, reinforcing the perception that Iran is trying to hide a weapons program. Iran scenarios: 'Political damage' or diplomatic gains? "I think that, certainly, the intelligence people have no doubt that ... this is an illicit nuclear facility, if only ... because the Iranians kept it a secret," Defense Secretary Robert Gates said on CNN's "State of the Union" program. "If they wanted it for peaceful nuclear purposes, there's no reason to put it so deep underground, no reason to be deceptive about it, keep it a ... secret for a protracted period of time," Gates said in the interview recorded Friday. In a separate interview on the CBS program "Face the Nation," Secretary of State Hillary Clinton called for the strongest possible sanctions if Iran can't prove a peaceful intent for the newly disclosed facility and its entire nuclear program. "It would have been disclosed if it were for peaceful purposes," said Clinton, who also was interviewed Friday. She added that Iran must do more than provide assurances at the meeting on Thursday, because past assurances proved false. "They can open up their entire system to the kind of extensive investigation that the facts call for," Clinton said. Later, she said: "The Iranians keep insisting no, no, that's for peaceful purposes. That's fine. Prove it. Don't assert it. Prove it." Clinton acknowledged that the United States knew of the previously undisclosed Iranian enrichment plant before Iran reported its existence to the IAEA. In the IRNA report on Sunday, Salehi noted that U.S. officials called the planned Qom facility secret even though they admitted knowing about it before Iran notified the IAEA. "They wanted to make this news public at a time that would yield them most [political] gain," he said, adding later: "We never intended to show our power but the creation of this installation, in the heart of the mountain in case of an eventual attack, is in and of itself an achievement." Gates and members of Congress from both parties said Iran's history of dishonesty over its nuclear program and the belligerent pronouncements of President Mahmoud Ahmadinejad raised questions about such promises. "I've got one rule of thumb: If the president of a country denies the Holocaust, you should believe the worst," said Sen. Lindsey Graham, R-South Carolina, on the CBS show. "The reality is, there is no military option that does anything more than buy time," Gates said in the interview conducted Friday. "The estimates are one to three years or so. And the only way you end up not having a nuclear-capable Iran is for the Iranian government to decide that their security is diminished by having those weapons, as opposed to strengthened. And so I think, as I say, while you don't take options off the table, I think there's still room left for diplomacy." Gates said "a variety of options" remained available, including sanctions on banking and equipment and technology for Iran's oil and gas industry. The Pentagon chief acknowledged that "China's participation is clearly important" in an effort to impose economic sanctions on Iran for flouting international rules for the development of nuclear enrichment facilities. Gates and Clinton both said that the upcoming talks offered the group of six world powers the opportunity for some potential "leverage" over the Iranians. "I think we are all sensitive to the possibility of the Iranians trying to run the clock out on us... So nobody thinks of this as an open-ended process," Gates said. In her interview, Clinton acknowledged that current sanctions against Iran's nuclear program were "leaky." She said the international coalition meeting with Iran could strengthen the sanctions effort, similar to the international backing for recent new sanctions against North Korea. Sen. Evan Bayh, D-Indiana, advocated for "more sticks ... than carrots" in dealing with Iran in the upcoming talks. "We've tried a variety of inducements to the Iranians over the years," Bayh said on CNN's "State of the Union." "Frankly, none of that has worked. What they respect more than anything is strength. They're contemptuous of weakness . . . So I think it needs to be mainly stiff economic and financial sanctions, with the possibility of other options lurking in the background if they don't change their behavior." On NBC's "Meet the Press," Sen. Jon Kyl, R-Arizona, said he has no doubt Iran is trying to build a nuclear weapon. "And the question is: How do you get in there to see fully what they're doing and find a way to stop it? Without international support, it's very hard," Kyl said. "But we haven't even exhausted the possibilities for unilateral U.S. sanctions," the senator said, adding, "what we're trying to do here eventually is to get a regime change with a group of people in there that are more representative of the Iranian people, who we really can talk with in a way that might end up with a good result."